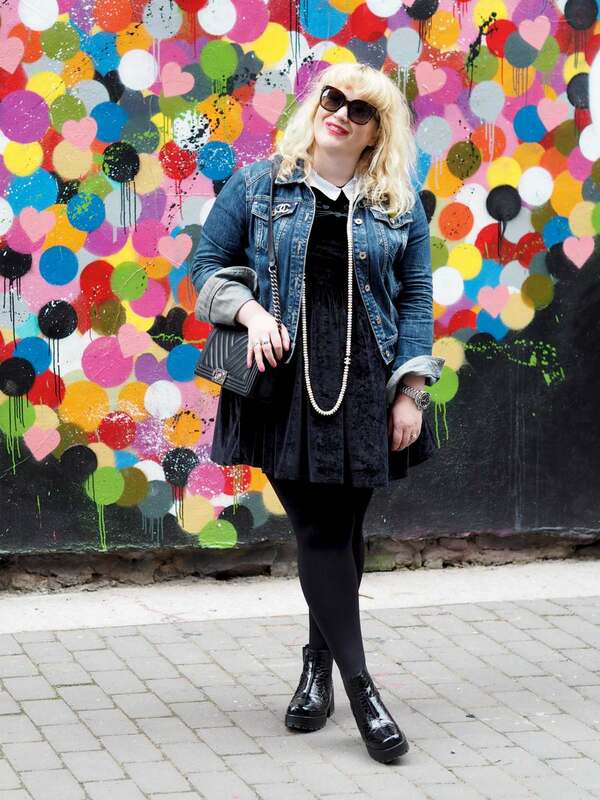 Jetsettin' to Dublin and Paris: Part 2 - Fashion For Lunch. Earlier this week, I headed to Dublin and then flew straight onto Paris. You can read all about Dublin in the blog post below, this part is all about Paris! We stayed in Paris for two nights and it is such a beautiful city, I thought I should split the post up by days, as I saw too much and took too many photos for just one blog post! On the first night we stayed in Villa Daubenton, which is in a wonderful location, just south of Saint Germain and in a beautiful and quiet part of town. If you fly into the city, it is really easy to get to, from Charles de Gaulle Airport, you just hop on the train (line B) and it is one single line to Port-Royal. From there is it just a short walk to the hotel, and a million times cheaper than a cab would be from the airport. 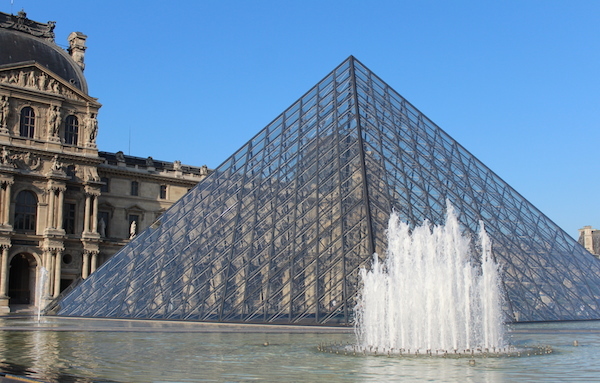 Once at Villa Daubenton, the local Metro station (Censier Daubenton) is really close and to get to the Louve / Pyramids, you just hop on line 7 and it takes you right there! In a taxi it will cost you 10euros (approx £9 or $15) from the hotel to the Louve. Villa Daubenton is so lovely, from the outside, it is an old French building, but inside the hotel it is decorated to be slick and modern, it is really nice and really clean. In our room we had a tiny kitchen area too, so if we had wanted to eat in, we could have prepared our food in the room and eaten it at the dining table. If you were staying for a few days, this would have been amazing, as I get bored of eating out for every meal and sometimes it is lovely to eat a home cooked meal and get in bed early! The staff were lovely and extremely helpful and in the morning they brought us the most wonderful breakfast of croissants, bread, yogurt and even hot chocolate! 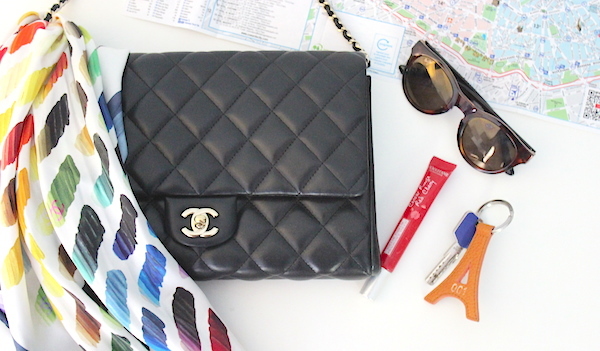 It was exactly what we needed for a day of exploring Paris! On the first night we ate at a wonderful little brassiere called Le Bis Repetita, just a few streets away from Rue de Rivoli. It was small but lovely! 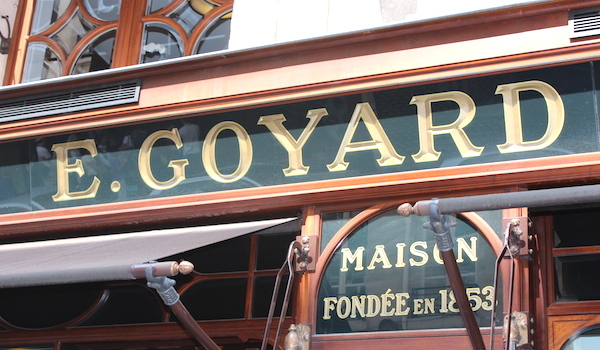 There are so many places to eat in the area, but something about this brasserie beaconed us in and we loved it! We were famished when we went in, but full when we came out! After dinner we went for an evening stroll down Rue de Rivoli and saw the Pyramids and the Louve as sun went down before catching a cab back to the hotel. 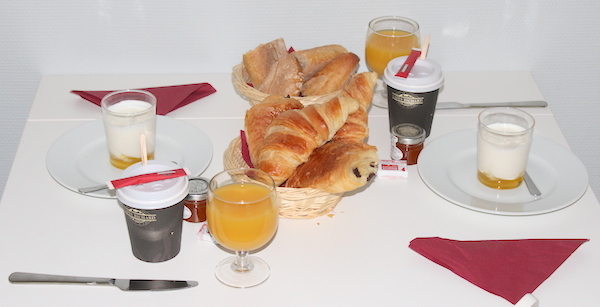 The following day, we had a delicious breakfast at Villa Daubenton and then hopped on a tube to the Eiffel Tower. The staff at Villa Daubenton are so helpful, they called us cabs and gave us all the directions and recommendations we needed during out stay. I love it when a hotel doesn’t just provide you with a room, but instead helps you with everything you would need to get the best out of the city! If you are looking for a modern, clean, quiet, design hotel in a great location with friendly staff, this hotel is perfect! I would love to go back to stay here again for a little longer, it was everything we needed! 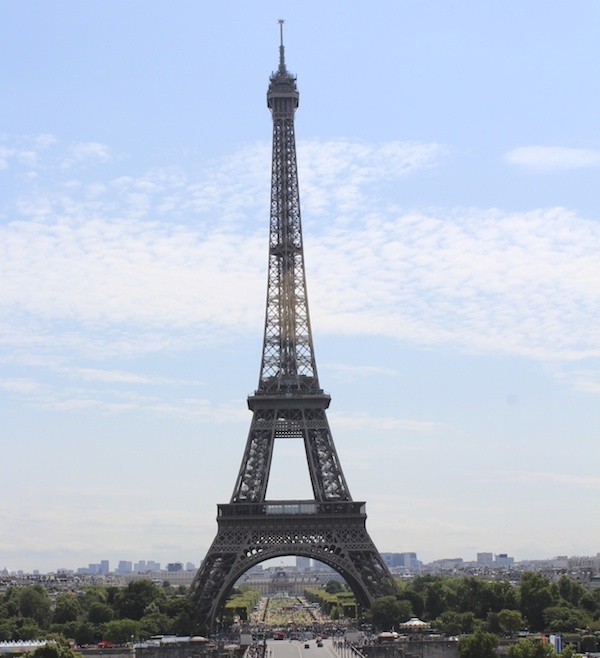 Normally to get to the Eiffel Tower, you would get off at the Metro station ‘Champ de Mars / Tour Eiffel’, as it takes you really close to the base of the tower. As this station was closed we were advised to get off at Trocadero instead, we were told it was a little further, but it was a beautiful walk. Oh wowzer!!! 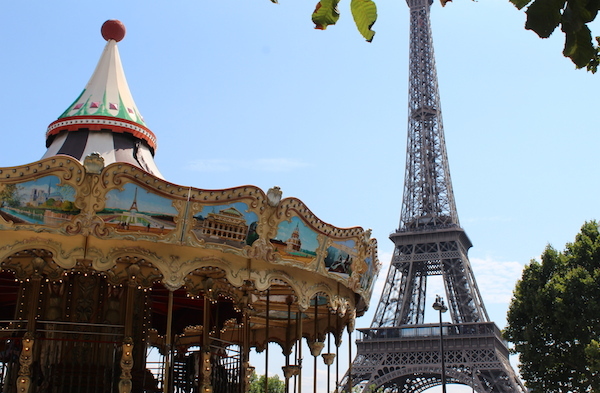 This is by far the best way to get to the Eiffel Tower, as it brings you out on the North side with the most stunning view looking over the tower. It is really beautiful and you are stood right at the top of the fountains and then you walk downhill, following the water jets to the base of the tower. I stopped every minute to take photos, as it was such an incredible view! It was pretty spectacular seeing the tower get closer and closer until we were at the base of it. By the time we had walked to the base of the tower, the crowds were huge and since we hadn’t pre-booked tickets, we would have been queuing for about two hours to get up the tower. I have been up the tower in the past and my boyfriend isn’t a huge fan of heights, so it didn’t seem worth waiting in a mile long queue. We loved the walk from the height of Trocadero and the view on our way down to the Eiffel Tower was incredible. So we felt like we had a pretty amazing experience without actually going up! Maybe next time we will forfeit our lie in and get there a little earlier! We walked from the Eiffel Tower, through the park, over a bridge and towards Rue de Rivoli for a spot of lunch and shopping. 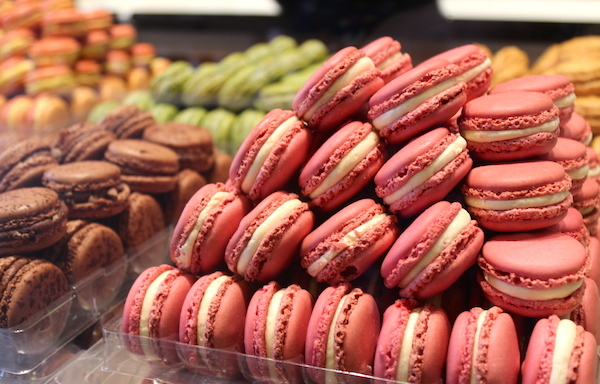 Our first stop was Pierre Hermé for macaroons, if you have never tried their treats, you really most pop in. 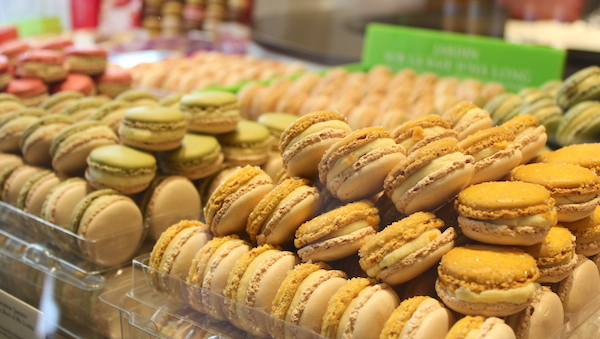 I think they have a small concession in Selfridges London, and they have stores in Paris, they are AMAZING macaroons and well worth hunting down! On Rue Cambon we stopped by Tom Ford where my boyfriend bought himself a treat and then we headed up to Chanel (The Mothership). 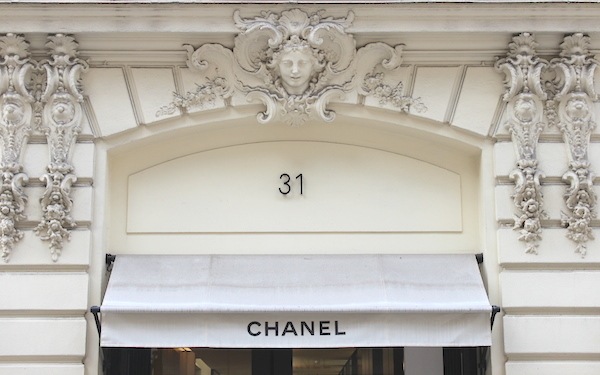 The Chanel on Rue Cambon is always packed, so if you are thinking about going, make sure you give yourself plenty of time, as there is lots to look at and you may not get served as quickly as you think. The staff are incredibly kind and helpful though, once you do get served, but the number of customers in store, can mean you have to wait a little longer, as they serve one customer at a time. I always find the customer service in Chanel is flawless! I couldn’t resist stopping by Goyard and snapping these amazing trucks outside their store. 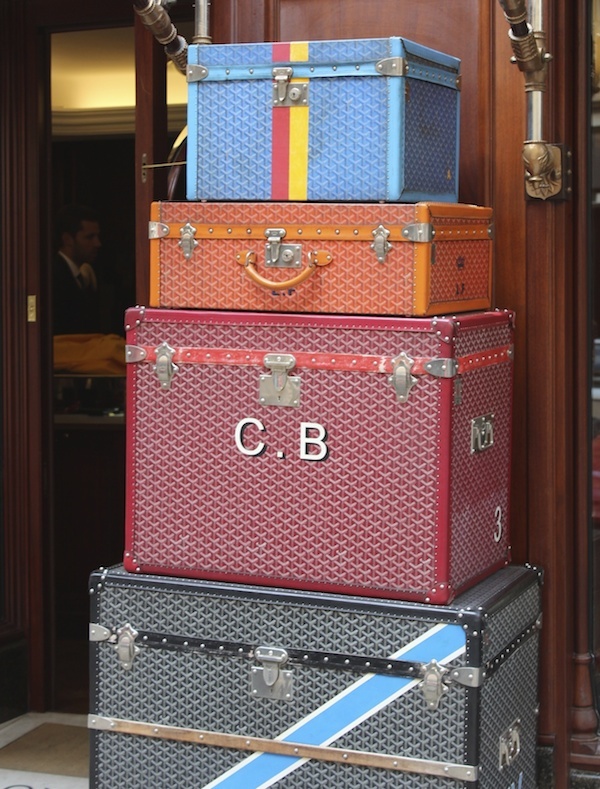 I love a good trunk and these monogramed beauties are pretty special! The rest of the afternoon was lovely, we got some lunch. although got massively ripped off when my boyfriend asked for an orange juice and our waiter suggested he had a ‘special drink with a blend of fruit juices’, it turned out to be a champagne cocktail. We did notice that there were some crossed words between customers and the wait-staff during our meal, so I don’t think we were the only people duped into champagne cocktails. We were not that fussed, it was a little more than we were expecting to pay for lunch, but it was fine. If you ever find yourself hungry on Rue Saint Honore, DO NOT visit Aux Delices de Manon, it turns out they have quite a track record of pulling tricks like this on tourists, check out their reviews on Trip Advisor! 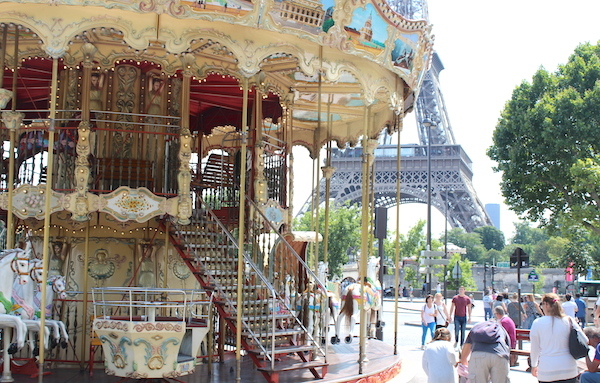 Coming soon… Part 3 of my Paris trip! Oh I think you could have split this up into hours not just days! I love Paris. 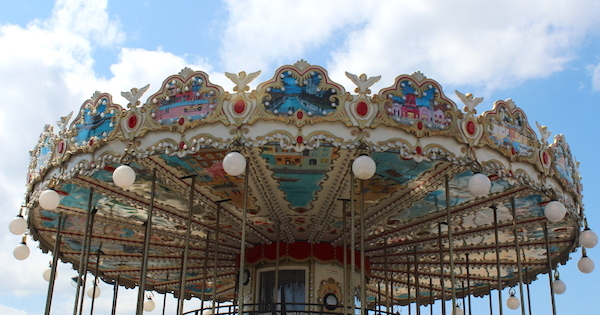 That carousel is wonderful.